Rhapsody on the Blue: Our first raft-up. We had our first raft-up the other day. 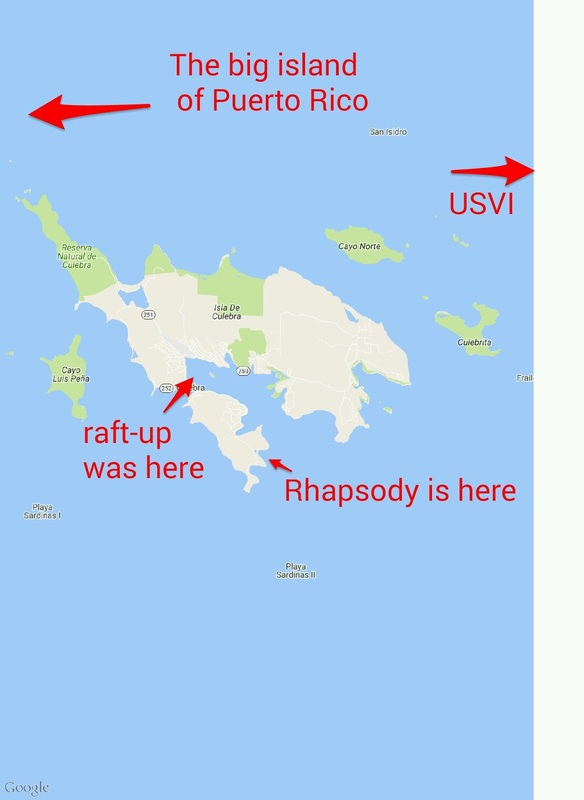 We motored our dinghy from Dakity harbor on Culebra, where Rhapsody is on a mooring ball, into Ensenada Honda, the main harbor in Culebra. It is about a 20 minute ride with our little 6 HP motor. The group had already formed. 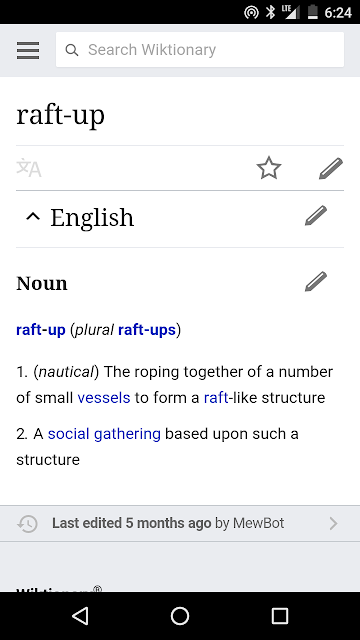 There were about a half dozen dinghies rafted up when we joined. The people in the dinghy nearest to us grabbed out painter (the line used to tie up the dinghy) and tied it to their dinghy. Another couple pulled our stern end in towards them, and we were rafted up. A few more dinghies joined us soon thereafter, bringing the total close to a dozen. Introductions were brief, and so many names were flying by it was hard to grab more than a few of them. There were several dinghies with small children and adolescents, the remainder of the dinghy occupants were couples. It was a potluck raft-up. Snacks were produced and passed from boat to boat. Grab some chips, a quesadilla, some crackers and dip, and pass it on to the next person. Each item made the rounds several times before it was gone, or people had had enough. The raft-up gently drifted around the harbor. At one point the conglomeration was nearing the mangroves (and the mosquitoes ) on the shore, so the two dinghies closest to the mangroves fired up their motors and slowly guided the group out toward the center of the harbor, avoiding the sailboats at anchor as we went. Lively conversations and laughter. Where have you come from? How long have you been cruising? Where are you going to? What cell service do you use and what type of data plan do they offer? We were definitely the newest and least traveled of the group (as far as cruising is concerned). Length of times on boats: 4 years on the boat, 3 years on the boat, 12 years in the Pacific. Us - 1 month, and the furthest we have traveled is from the BVI! 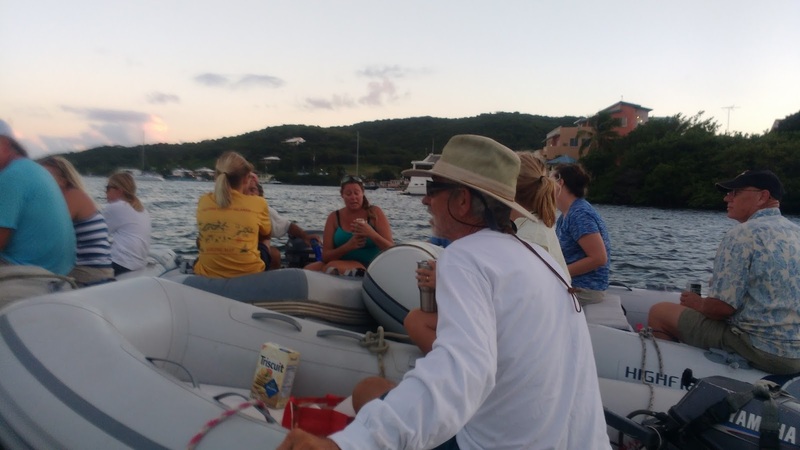 Most boats are generally heading "down island" at this point, meaning heading south in some fashion, usually aiming towards Grenada by the beginning of summer and the hurricane season. Suddenly the rain clouds released their contents and the raft-up was no more. People hurried back to their boats to shut the hatches that had been left open. Fortunately for us, and our long dinghy ride home, our hatches were not open, nor did the rain last very long. A wonderful way to spend an evening, a wonderful way to connect with other cruisers. Many thanks to Tammy on S/V Dos Libras for organizing it. Our first raft-up, and hopefully there will be more to come. It really is. I am hoping there will be more.